ISBN 9790006451906. 8x11 inches. Language: Italian ,German. Translation: Kurt Honolka. Text: Da Ponte, Lorenzo. In the space of a few months, in the autumn and winter of 1789, Mozart filled more than 650 pages of a score that shows practically no signs of mental or physical exertion. 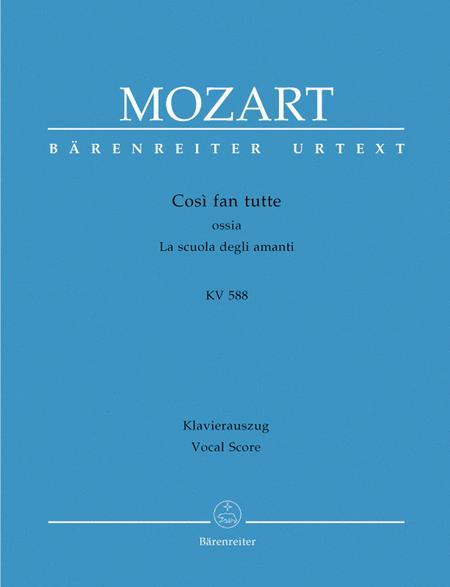 The result was one of his most profound operas, Cosi fan tutte , which has held listeners spellbound with its blend of bitterness and comedy to the present day. 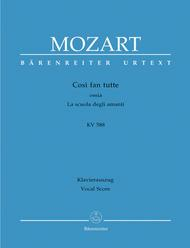 Our new easy-to-play vocal score is based on the volume edited by Faye Ferguson and Wolfgang Rehm for theNew Mozart Edition(NMA II/5/18) and on the latest scholarly findings from the critical commentary published by Henning Bey and Faye Ferguson in 2003.
hard to follow, especially when coupled with Schirmer's subpar printing. Worth every peny! , this hardcover book lies wonderfully flat on the stand. This piano reduction has much more of the original musical material in it than the Schirmer piano reduction. It even tells you which instruments play what. However, this also makes it more difficult to play, and less idiomatic for the piano. Playing from the Barenreiter score, things sound a bit more strained. But also more accurate and more like Mozart. With all those benefits, this score also costs about 3 times as much as Schirmer. Between cost and piano playability, there are reasons to buy either one, I think. 41 of 79 people found this review helpful. Gorgeous edition. More expensive than Schirmer but totally worth it if you're working on a role. 35 of 78 people found this review helpful.